Mortgage Vintage maintains a simple business model and employs a common sense underwriting approach on each transaction. We lend based on collateral and ability to pay. Our simple philosophy is, “We will lend if you would lend”. 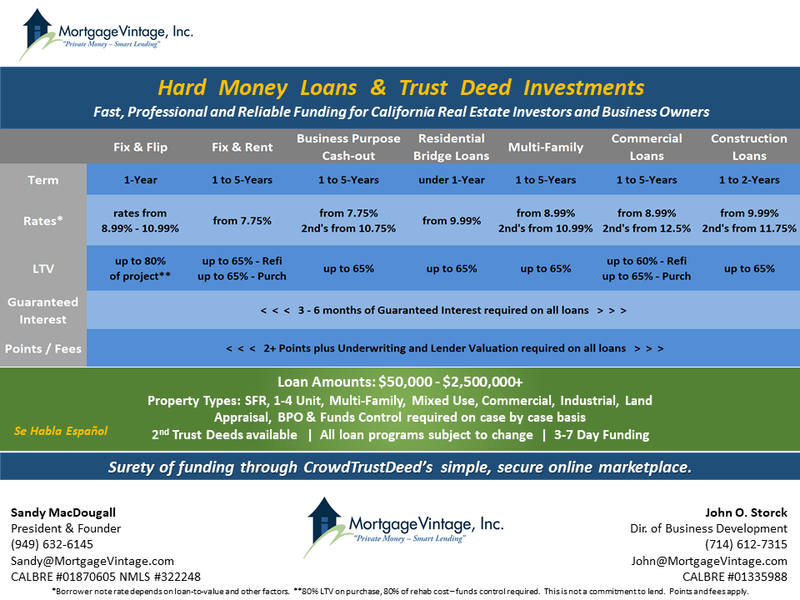 Below is a list of our hard money loan programs. Click the blue link for additional information on each respective program. Accessory Dwelling Unit Construction Loan Program: This program provides financing for additional dwelling unit construction on non owner-occupied properties. Business Purpose Cash-Out Loan Program: This loan provides 6 months to 5-year loan terms for cash-out loans for a business or investment purpose. These cash-out loans are secured by residential and/or commercial real estate. Excellent for self-employed and owner occupied borrowers, the Business Purpose Cash-Out allows owners to pull out cash if the loan is for a business purpose. Cannabis Business Purpose Loan Program: This loan offers 1 to 5-year terms on purchase or cash out loans for cannabis related businesses. Our Cannabis Business Purpose Loans can be made using residential or commercial properties as collateral. 1st or 2nd trust deeds available for this loan program. Commercial Hard Money Loan Program: Our Commercial Hard Money Loan Program provides for a 1 to 5-year loan term on retail, industrial, office and other small commercial properties. Savvy Real Estate Investors use leverage and deploy this program for use in acquiring distressed or income producing commercial property. Construction Hard Money Loan: Residential Construction Bridge Loans are for a homeowner that needs financing to fund a ground-up construction for what will be their new “owner occupied” home. Like the residential purchase bridge loan, this construction bridge loan is less than 12-months in duration. Fix and Flip Loan Program: The Mortgage Vintage Fix and Flip loan program is designed for active re-habbers with a track record of acquiring distressed properties, fixing them and selling them profitably within 12 months. Real Estate Investors doing Fix and Flips appreciate a fast and professional team member. Fix and Rent Loan Program: The Fix and Rent Loan Program is either for purchase or refinance where the borrower plans to rehab the property and then rent to a tenant. This Fix and Rent Hard Money Loan Program provides Real Estate Investors with capital to purchase or refinance for rehab and rental of a single family, multi-family or commercial property. Foreign National Loan Program: This program allows foreign investors to purchase or refinance California real estate quickly with a minimum of documentation. Hard Money Land Loan Program: This loan program allows for the purchase or refinance of raw or entitled land for subsequent development. Multi-Family Loan Program: Our popular Multi-Family Loan Program provides a good hard money alternative for Real Estate Investors looking to capitalize on the growth in Multi-Family. This loan program provides a 1 to 5-year term for purchase or refinance loans on Multi-Family properties. Owner Occupied Construction Loan Program: This program provides financing for consumer ground-up construction on owner-occupied properties. Residential Bridge Loan Program: Residential Hard Money Bridge loans are for a term of less than 12-months and allows a homeowner to purchase a new “owner occupied” home before he/she has sold their existing home.